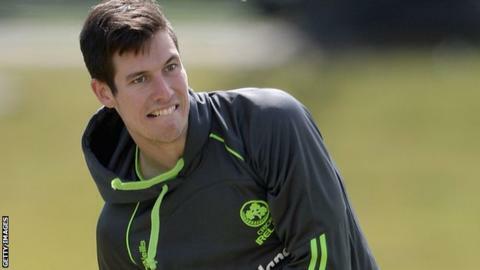 Somerset have released Ireland international left-arm spinner George Dockrell, as well as fast bowler Adam Dibble and wicketkeeper James Regan. Dockrell, 23, made his Championship debut for Somerset in 2011. Dibble, 24, has played four first-class matches between 2009 and 2015, while 21-year-old Regan made only one first-class appearance. "It is always tough to release young players," said Somerset director of cricket Matt Maynard. "But ultimately we do have to make the types of judgments that are in their long-term interests, as well as the club's. "In the cases of Adam, George and James, that task is made all the more difficult because they are outstanding young men. I am sure all of them will have a promising future in whatever direction life takes them." Dockrell, who has taken 126 first-class wickets, spent time on loan with Sussex this season. He said: "I first came over to Somerset when I was 15 years old. Since then I have enjoyed all of the time that I have been involved with the club. "I would like to thank Brian Rose for signing me in the first place and giving me the opportunity to play for the county where I have felt so at home."